It’s National Shed Week this week, so let’s celebrate all things ‘sheddie’. Please send us your pictures of your shed whether it is a simple shed to hold your diy and garden tools, whether you use it as an office or craft workshop or whether it has a much more intriguing use……..we want to see! The finalist of the Shed of the Year 2012 was also announced at the weekend to launch the start of National Shed Week 2012, and our congratulations goes to John Plumridge from Shrewsbury who won with his Woodhenge Pub Shed. A shortlist of fantastic sheds was drawn up after a public vote and then the judging panel consisting of competition creator Uncle Wilco, property expert Sarah Beeny, author Neil Gaiman, creator of Shedworking Alex Johnson and the 2011 winner Jon Earl, were given the task of deciding the winner. 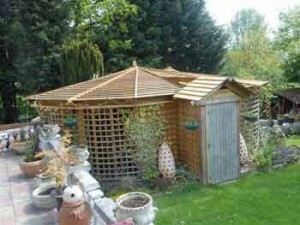 Take a look at the shortlisted sheds at www.readersheds.co.uk . If you need some DIY Doctor help regarding sheds, we have projects on the basics of putting up a shed, building a concrete shed base and fitting a lock on you shed. You could take a look at all the most popular sheds on readersheds and maybe get some inspiration for your own!